In news video footage (France 3, 07 Jun 2011), Bernard Genin, Mayor of Vaulx-en-Velin, shows a flag he brought back from a trip to Palestine. (The image is missing three small inscriptions, one in Hebrew, one in Arabic, and one illegible. The Hebrew one is "[something] peace" (... שלום); the Arabic is probably the equivalent. It misses a fourth inscription as well: at the bottom, only visible in those shots that show almost the entire flag unobscured is yet another inscription. «Breaking the Ice» is a peace project by Israelis and Palaestinians. A mixed group is on the way to climb together a mountain in the Antartica for the first time to show that is possible for the peoples to work together and to trust each other. German TV ARD shows this week several reports of the journey. The first part was a sailing trip. On the boat was set the project flag. Unidentified young Palestinians and Israelis from the University of Haifa in Israel pose while displaying a flag symbolizing the peace between their two countries on the summit of Mont Blanc, in the French Alps, Thursday, Aug. 5, 2010. The expedition organised by the 'coexistences association' is led by Swiss mountaineer Jean Troillet and is supported by the cities of Chamonix, Coumayeur and Haifa. White flag with two circular segments of the IL and PS flags, over which there are superimposed two (rather ragged-looking) white birds (doves, I guess) in flight. The flag is only Israeli. There are no Palestinian students at the University of Haifa. Those students were sent by The Jewish-Arab Center in this University and are all Israelis (Jews and Arabs). You can read about it at http://www.coexistences.ch/pdf/JewishArabCenter.pdf. It seems that the birds have eyes, and the Magen David is solid? I don't think the ones in the photo did... the drawing could have been a prototype. It would appear each dove was drawn to hide most of the specific charge of the flag it is on. Also, the blue stripes are rather wide, for a flag of Israel. Both, I guess, to create two similar flags that each consist mostly of a white stripe with coloured stripes above and below. 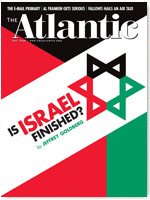 The May 2008 issue of the US newsmagazine the Atlantic Monthly featured a story with the provocative title "Is Israel Finished? ", specifically on the danger to its stability and character posed by Arab demographic growth. The article suggested that the inextricability of the two peoples may result in a binational outcome becoming inevitable, a point illustrated by the cover image, a composite Israeli-Palestinian flag. A photo of this flag can be found here (Image). Another one, which seems to originate from Haaretz newspaper website can be found at several websites, like here and here. From http://one-state.net/, this multicolored horizontal striped flag for a 'One-State Palestine' may have some contemporary interest. Of course, it should be noted that the site is notoriously anti-Israel and anti-Zionist.